I sure do love winning! Who doesn't? 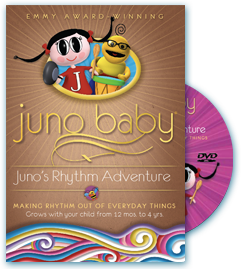 Last week we received the new Juno Baby DVD that we won from Hip Mama's Place. Since it came the day after a Baby Einstein DVD from Netflix, it's taken us a few days to watch it. When I put it on this afternoon, Maggie was immediately sucked in. She loves it! It's puppets instead of animation, which is a switch from a lot of shows, but right up Maggie's alley. The character of Juno is a real cutie. She's got black hair with pigtails like Pippi Longstocking (standing straight out). Maggie loves her pigtails, but won't let me put pigtails in her hair. She says they're just for the girl in the movie. The cat and the bumblebee are also favorite characters. I unfortunately haven't figured out what the other yellow guy is yet, so we just don't talk about him by name. Thanks again to Hip Mama's Place and Juno Baby! I'll have to watch it so I know what's going on :) Always fun to win something isn't it?